We believe that all children are born with the innate ability to learn and that learning begins at birth and continues throughout life. When a child is exposed to the proper stimuli and given the necessary training, he or she will grow up to be a success as well as a productive citizen of society. "Train up a child in the way he should go; and when he is old he will NOT depart from it." All children are precious in the sight of God and must be taught godly conduct. This Child Development Center Academy will serve as an auxiliary for the parents of this community as the y proceed in the teaching and training of their children. This ministry of First Baptist Church Denbigh is a ministry to the total person and EVERY child in the community. Surround pupils with a God fearing staff who will teach by precepts and examples. 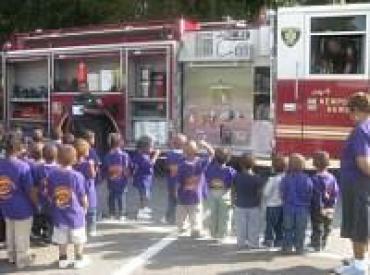 Provide a safe and healthy environment for children ages two and a half through twelve years of age. Provide activities and experiences that will stimulate and challenge growth and learning appropriate to age. Assist each child in discovering and developing his/her greatest potentials. Establish a firm foundation in each child for which he/she can build upon. Assure that each child will become morally acceptable, emotionally stable, intellectually sound, socially adjustable, physically fit, and spritually fed. Build an attitude of success and high self-esteem in each child. 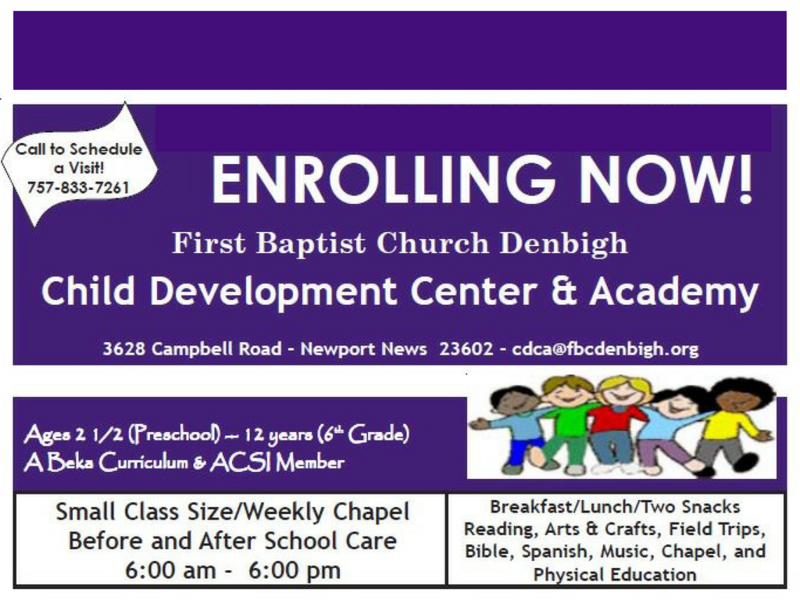 Through the implementation of the Abeka Curriculum, First Baptist Church Denbigh Child Development Center Academy Will Provide an environment conducive to the expected learning. 2 1/2 to 12 years old. All meals are USDA certified. Our meals program include breakfast, lunch, and two snacks daily. Abeka Curriculum and Character Development Students at the Kindergarten level are given the Stanford Achievement Test. Chapel every Wednesday at 10:00 a.m. The center shall offer its services to the community to all qualified applicants for admission or employment without regard to gender, race, color, or national origin. 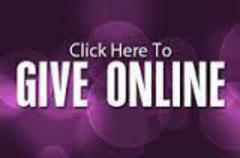 All required enrollment documents are available for immediate download for your convenience. Join us on Facebook for all CDCA news, pictures and events. See you there! Spirit Day during "Red Man Hot"
Contact technology@fbcdenbigh.org with questions or comments about this site.